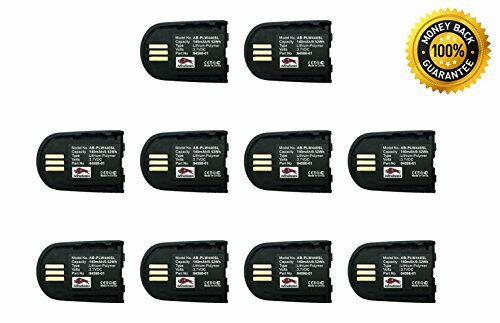 ✅ COMPATIBLE WITH MOST PLANTRONICS SAVI: With this battery you can bring your Plantronics Savi WH500,W440,W740, W745 back to life! This battery is the perfect replacement for Plantronics 84598-01 and it is made to work like a charm with any of the models mentioned above! ✅ BETTER THAN OTHER BATTERIES ON THE MARKET: The initial battery of your headset possibly lasted just for a couple of hours, but that's not the case with the AvimaBasics battery. Made of lithium polymer, this 3.7V / 140mAh battery will last all day, saving you time and maximizing the use of your wireless headset. ✅ PERFECT FOR HOME OR OFFICE: With this powerful battery you can keep your headset wireless for hours. Never worry about draining off battery the moment you really need it. Use this long lasting battery for your home or office equipment and make sure that no important call will be missed again! ✅ SAVE YOURSELF MONEY & EFFORT: Benefit from the unique offer of AvimaBasics! If you order one of the smart packages provided, you get special discounts. Equip your office, order more batteries in advance for your home or offer some batteries of great quality to your co-workers and get more while spending less! Buy one of the multi-packs offered on this listing and SAVE! ✅ GET IT WITH CONFIDENCE: AvimaBasics does not only provide you with batteries of great quality, but they also offer you one year of unconditional warranty! Rely on AvimaBasics' experience and unique customer service, and the results will be definitely rewarding! If you have any questions about this product by AvimaBasics, contact us by completing and submitting the form below. If you are looking for a specif part number, please include it with your message.